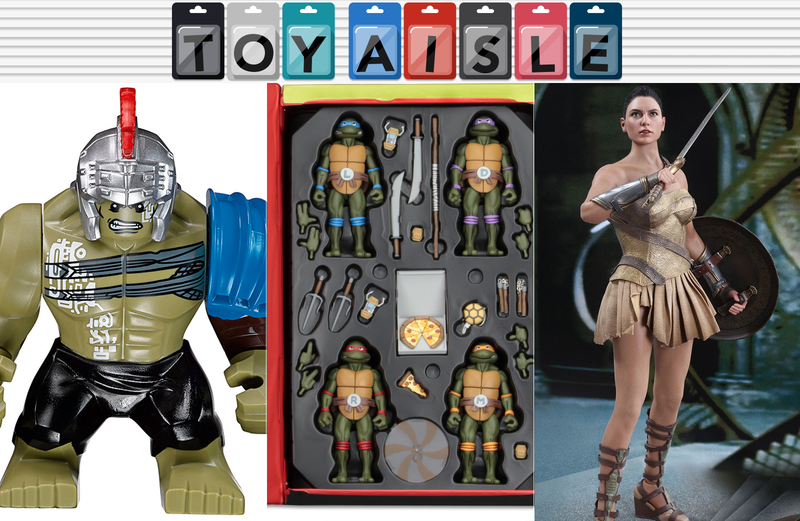 Welcome back to Toy Aisle, io9's weekly roundup of the fanciest toys around. This week we’re already hiding our wallets from amazing SDCC exclusives, plus Hot Toys teases its next Wonder Woman figure, Thor: Ragnarok comes to Lego, and a Transformer turns into a giant medieval dragon. No, really! Hot Toys’ first crack at a Wonder Woman figure, its Batman v Superman version, didn’t quite nail its likeness of actress Gal Gadot. But now that the character has finally gotten her own film that critics seem to be adoring, Hot Toys’ follow-up finally does Gadot justice. The 12-inch figure features Wonder Woman in her training armor, not her more recognizable outfit, and as with all of Hot Toys offerings, it comes with countless accessories like weapons and swappable hands. Summer’s almost here, which means it’s time for Marvel and Disney to flood theaters and toy stores with movies and collectibles you can pretend you’re not going to buy this time. Except... Lego is introducing two new sets tied to Thor: Ragnarok featuring a bunch of minifigures you’ll want to add to your collections. The Ultimate Battle for Asgard, available August 1 for $50, comes with six minifigures including Thor, Bruce Banner, Valkyrie, Hela, and the Commodore spaceship. But the $60 Thor vs. Hulk: Arena Clash set, also available August 1, includes a gladiator Hulk figure that few Lego or Marvel fans will be able to resist. Hasbro just revealed a handful of new figures for the upcoming Transformers: The Last Knight that shed a little more light on the film’s plot and characters, but raise a few other questions. The $20 figures, available closer to the film’s release, include a dragon named Skullitron, a new version of Megatron who turns into a stealth bomber, a Lamborghini Centenario version of Hot Rod, and Anthony Hopkins’ characters’ butler Cogman, who can apparently transform into a full-size Aston Martin. Do the laws of physics not exist on Cybertron?